When you’re planning your dream wedding, and looking to take advantage of the beautiful Las Vegas climate, what better place than a lakefront setting? At Always & Forever, we have a whole host of Lake Wedding options for you to choose from to make your wedding not only beautiful and memorable but also easy to plan and afford. 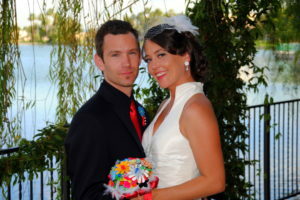 Always & Forever has a selection of Las Vegas Lake Wedding options, suiting weddings for up to 100 guests. We can help you make arrangements for just the ceremony, or the ceremony plus reception with everything included to make things as simple as possible for you—and to take the stress out of wedding planning. 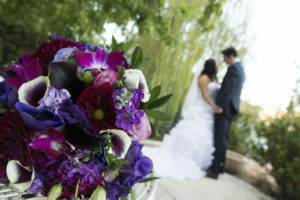 We have trained, certified wedding consultants to help you plan every aspect of your special day. These consultants are available to assist and their services are included with every wedding package, helping you to have more peace of mind and an easier planning process. They will help to ensure your wedding day is exactly as you imagined. For the perfect lakeside wedding, we provide a romantic backdrop: a lakeside gazebo with floral and ivy décor, complete with your ceremony held right on the dock with the sound of the water flowing beneath you. At our Lakeside Garden option, your romantic wedding setting will be held at a lakeside dock, complete with water flowing beneath your feet as you say your vows. We have a beautiful gazebo decorated with ivy and floral that will complete the dreamy setting. 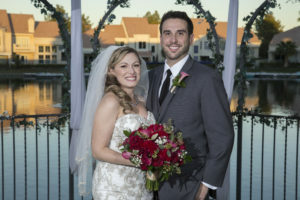 The Grand Lakeside Ceremony options, as the name implies, have a grand setting for your special day. We provide the romantic atmosphere, and help you with creating a simple and beautiful wedding—while taking the stress out of planning. Grand Lakeside weddings are held adjacent to a calm 33-acre lake, providing serene views for you and your guests. If you’ve dreamt of saying “I Do” at a fantastic lakeside locale, this is the spot for you. Last but certainly not least, Always & Forever also offers a beautiful all-inclusive option: the Waterfall Garden. 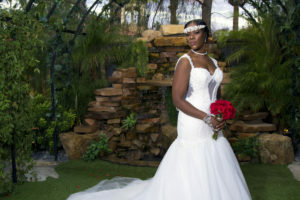 At the Waterfall Garden, your dream of a waterfall wedding can become a reality. The backdrop for the ceremony is a gorgeous 6-foot waterfall, cascading behind you. 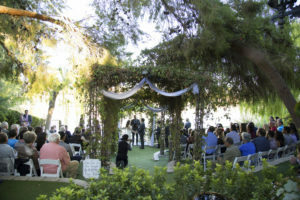 This spot is ideal for an intimate ceremony, and can host up to 20 guests. After the waterfall ceremony, you’ll proceed to the elegant banquet room we’ve set up to host your reception. This package starts at $1,850 Monday through Thursday, and $1,950 Friday through Sunday. 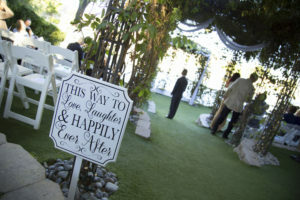 It includes the Waterfall Garden for the ceremony for up to 30 minutes, and use of a private bridal room for 30 minutes prior to the ceremony. We’ll provide a licensed officiate ($75 fee separate) for your choice of a traditional or civil ceremony. As with all of our wedding packages, you’ll of course have the services of our certified event consultants to ensure everything is as you expect. For the reception included in the Waterfall Garden package, the banquet room is reserved for an hour and a half, and we’ll have it all set up for you with linens in the color of your choice. Your guests will be treated to a champagne toast, and we’ll provide the music too! 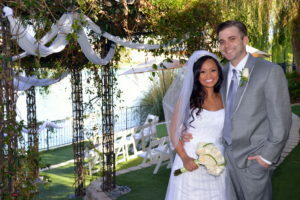 Las Vegas Lake Wedding Packages: What is Included? There are inclusions beyond this list—this is the minimum inclusion for all wedding packages (Charming, Alluring, Dazzling, and Enchanting Package options). If you select the Dazzling or Enchanting options with up to 50 guests or up to 100 guests, respectively, you’ll have even more inclusions—including additional time for the ceremony and photos, as well as use of a bridal room in advance. The Enchanting option even comes with limo service for the bride, groom, and up to four guests. 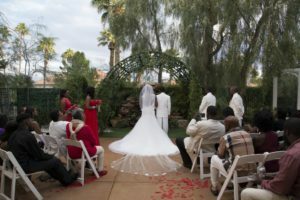 As you browse the various Las Vegas Lake Wedding package options, you’ll see what is included for each of the package choices: Charming, Alluring, Dazzling, and Enchanting. Be sure to check out each individual package page for more details. While we take great pride in creating beautiful experiences where you can leave almost all the details in our hands, there is still room for some customization to create your dream wedding. And don’t forget, with the Waterfall option above, there’s a reception included too. Even if you don’t opt for the Waterfall Garden, you still have the choice to add on a separate reception package, which can be booked to accompany any of the ceremony options. Always & Forever’s trained, certified wedding consultants are here to help you create an elegant wedding without the stress. We can handle all of the minute-to-minute details to let you focus on the rest of the wedding, where you’ll be able to relax and enjoy the big day. 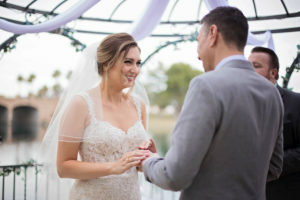 Our Las Vegas Lake Wedding options are beautiful and unique, allowing you to have a romantic setting without all the legwork. Please take a look through the rest of the site to see all of the ceremony and reception options, and then get started right here online! You can also give us a call at (800) 259-2978 or (702) 318-5683 with any questions—we’d be happy to help you work out all the details and start putting together your dream wedding today!